How do you feel about mountains? Do they inspire you? Scare you? Make you feel amazed? Or maybe you feel a bit uncomfortable? We've hiked and scrambled up quite a few places and have found it quite incredible! The Bible is full of references to mountains, but in this first part we'll just look at Jesus, his disciples and mountains. Matthew 17.1-2 (Message) - Six days later, three of them saw that glory. Jesus took Peter and the brothers, James and John, and led them up a high mountain. His appearance changed from the inside out, right before their eyes. Sunlight poured from his face. His clothes were filled with light. 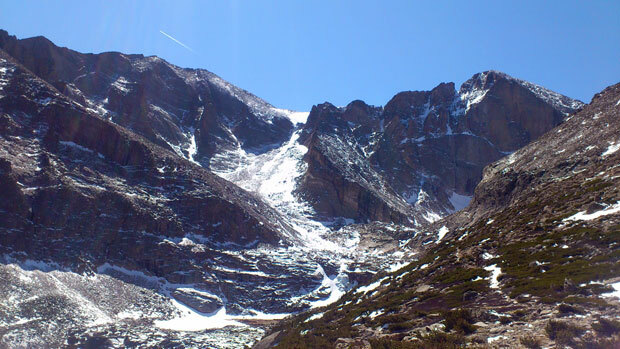 The picture below was taken in Colorado near a place called Longs Peak which rises to over 14,000 foot. There is something quite special about mountains - not just as a place to get away, but also as a place to go up. The day we visited this place was quite awesome and it was difficult to turn around and head back down the trail !! The three disciples saw Jesus filled with bright light and sunlight up the mountain. They saw Jesus in a whole new way and a whole new light (sorry, wasn't meant to be a joke!) But that is what can happen when you go up a mountain - you can draw closer to God and see him in a whole new way - your perspective changes. Imagine the conversation (or maybe silence) the disciples had as they came down the mountain! Matthew 17.9 - Coming down the mountain, Jesus swore them to secrecy. "Don't breathe a word of what you've seen. After the Son of Man is raised from the dead, you are free to talk." A Prayer: Lord, I thank you for the world you created. Thank you that my life is like a journey and that if I believe in you, one day I will reach the 'highest place', heaven, to be with you forever. Lord, I pray that you would meet with me as I journey with you. Thank you for mountains, for the ability to go 'up' and for the promise in the Bible that as I draw close to you, you will draw close to me. The mountain in the Old Testament was often the place where people met with God. Time and again, we find that people went up the mountain to meet with God. I recently watched a programme on The Discovery Channel about people climbing Everest. One guy who had previously seemed quite tough, just broke down as he was near the top. He was overwhelmed at what he saw; he had no words to say, only tears. Exodus 19:20 - The LORD descended to the top of Mount Sinai and called Moses to the top of the mountain. So Moses went up. Exodus 24:17 - To the Israelites the glory of the LORD looked like a consuming fire on top of the mountain. Exodus 24:18 - Then Moses entered the cloud as he went on up the mountain. And he stayed on the mountain forty days and forty nights. God spoke to Moses up the mountain when he had something very special to say. Other times, God had led by cloud, fire and spoken in the Meeting Tent. But God called Moses up the mountain to speak to him. It is awesome to think that while Moses went up the mountain, the Lord came down to the mountain. Let's never forget that God is higher than us, but that (like Jesus, see Philippians 2) he comes down to meet with us. And Moses didn't just go up part of the mountain. God spoke to him specifically to go up to the very top of the mountain. In our Christian life, God wants us to be completely obedient and to go to the very height of what he has for us. Only in that place do we really find God. A Prayer: Lord, thank you for your vast creation of mountains. Moses went up to meet with you on the mountains and I want to meet with you there too. Lord, you speak to us through a love of mountains or your creation, and a mountain is symbolic of you drawing is 'up' and closer to you. Lord, thank you that you care so much about us and I ask that I would know you more and have your joy as I go up!